New Coventry City manager Mark Robins has brought in his former Rotherham United and Barnsley number two Steve Taylor as first-team coach. 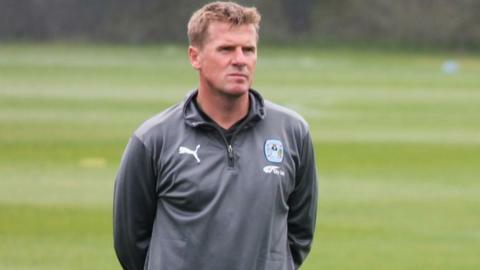 Taylor, 42, will work alongside assistant manager Richard Shaw and Under-21s coach Lee Carsley, Coventry's caretaker team for five games following Andy Thorn's sacking on 26 August. "I know Lee Carsley from when I coached him at Derby," said Taylor. "And the response we have had from the players so far has been fantastic." He added: "I've only had a couple of training sessions with the players but the tempo has been good and I'm looking forward to the challenge." Sky Blues development director Steve Waggott said: "Mark was keen to bring Steve to the club to support him alongside Richard, Lee and our goalkeeping coach Steve Ogrizovic. "I am sure the players will see the benefit of his experience." Taylor's career in coaching began as a 20-year-old after his playing days were cut short at Derby through injury. After joining the coaching staff at the Rams' academy, he moved up to become assistant manager under George Burley before linking up with Robins at Rotherham.